The initial concept for Imagine/Align began as a metaphor in relation to the often arbitrary nature of imposed lines and borders drawn on the earth. (Separating us from them.) This imaginary "drawing" is a yellow line that travels through the open landscape with daffodils as its ephemeral marker. They come up, bloom, and die away every year in their own natural rhythm. There will be no attempt to alter its naturalization. This is the fourth bloom for this community art project. Please visit Nichols Arboretum and walk the line to experience this project that involved the help of over 150 community volunteers. And especially, to witness the contemplative power of the mark of a single line. Last update was on 4/3/07. Imagine/Align is a site-specific, community-based art installation by Susan Skarsgard at the University of Michigan Nichols Arboretum. 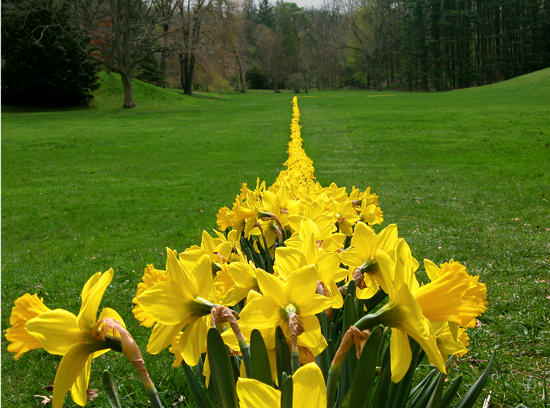 This project, which bloomed for the first time in March 2004, is a one-half mile long line of 20,000 yellow daffodils traversing the environment, mapping thought and inspiring contemplation.